The Drager X-am 2500 was especially developed for use as personal protection. 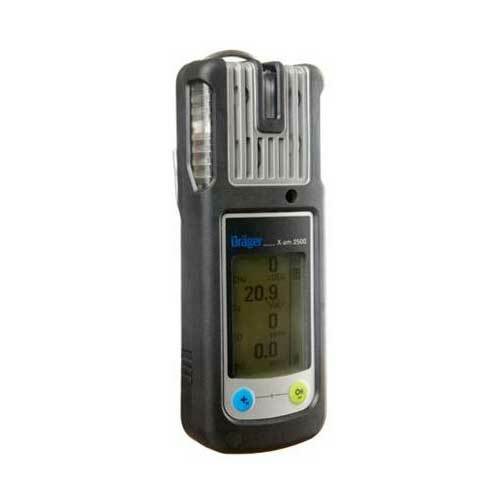 The 1 to 4 gas detector reliably detects combustible gases and vapours, as well as O2, CO, NO2, SO2 and H2S. Reliable and fully mature measuring technology, durable sensors and easy handling guarantee a high degree of safety with extremely low operating costs. DURABLE ELECTROCHEMICAL SENSORS - Fully developed, high performance Drager sensors in an extra small format for CO, H2S, O2, SO2 and NO2 gases enable safe use in industry, mining and in refineries. The impressive hydrogen sulphide sensor has a high resolution, so it can reliably measure even very low workplace limits. The non-consumptive and lead-free sensor for oxygen is characterized by an especially long service life of more than 5 years. Our CO and H2S sensors also have this long service life expectation, so they contribute to especially low operating costs. POISON RESISTANT EX SENSOR - The innovative, catalytic Ex sensor is impressive due to its high resistance to silicone and hydrogen sulphide. Together with the high degree of drift stability, this resistance enables an extraordinarily long service life of more than 4 years. Its high sensitivity with regard to flammable gases and vapours is confirmed by technical approval for measuring according to IEC/EN 60079-29-1 from methane to nonane. This approval also demonstrates the suitability of this instrument for use in refineries and in the chemical industry as well. MAXIMUM SAFETY - The Drager X-am 2500 has Ex approval for zone 0, so it is clearly designed for very high user safety in areas subject to explosion hazard. The functional design ensures that gas can enter from above and from the side - even if the instrument is inside a pocket or if the front gas entry is accidentally covered. MAINTENANCE: FAST, EASY, INEXPENSIVE - From functional test to complete documentation, users have access to practical solutions that provide safety for implementation at any time. The Drager Bump Test Station, which does not require a local power source, and the automatic Drager X-dock testing and calibration station for comprehensive equipment management are ideal system additions that save time and effort. Together with the Drager X-dock, the high quality Drager sensors enable quick bump tests of 8 to 15 seconds1) with very low gas consumption. This significantly reduces your equipment operating costs. DIFFUSION OR PUMP - For clearance measurements for tanks and shafts or when searching for leaks, an optional external pump with a hose up to 30 m long is the optimum solution. When the measuring instrument is inserted, the pump function starts automatically. The switch from diffusion to pump operation can be handled quickly and easily without tools or screws. ERGONOMIC AND ROBUST - Thanks to its low weight and ergonomic design, the Drager X-am 2500 offers a high degree of wearing comfort. The practical two button control panel and easy menu navigation allow the instrument to be used intuitively, despite its comprehensive functionality. The integrated protective rubber coating and sensors that are not sensitive to shock provide additional safety in case of impacts or vibrations. Moreover, the Drager X-am 2500 is not sensitive to electromagnetic radiation, e.g. from wireless devices. The Drager X-am 2500 is water and dust resistant in accordance with protection class IP 67, so full functionality is guaranteed even if it falls into the water. RELIABLE POWER SUPPLY - The Drager X-am 2500 can operate with either alkaline batteries or with rechargeable NiMH batteries. This enables a reliable power supply for more than 12 hours, and with the high capacity battery pack more than 13 hours. Depending on the requirements, the batteries can be charged either in the workshop or in a vehicle. Operating time without Ex sensor is typically more than 250 hours.